SEPT. 24 UPDATE: 13 Action News spoke with the family of Zion Jimenez Monday night. "Every night from the moment that I wake up to the moment that I go to sleep, that's all I want to know, is what was going on in his head," said mom April Jimenez. Jimenez has four children. Zion was her first child. He succumbed to his injuries approximately six days after the crash near Vegas Valley Drive and Mountain Vista Street. Police have identified the driver who allegedly fled the scene as Jonathan Mora. They are still searching for the 23-year-old as of Monday. Meanwhile, Zion's family is trying to raise money for the 10-year-old's funeral on GoFundMe . They have also planned a car wash fundraiser for September 30th at 4445 East Charleston Blvd. The car wash will take place from 9am to 4pm. According to loved ones, the 10-year-old had a deep love for God. "Zion was the first one at the altar, at church service and he'd be the very first one on his knees praying," said aunt Mayra Ramos. It is that love that inspired the family to donate his organs. According to Jimenez, her son's kidneys, liver, pancreas and heart went to four people in need. "Just to know that my son lives in somebody else is a blessing to me, because I know that's what Zion would have wanted," she said. 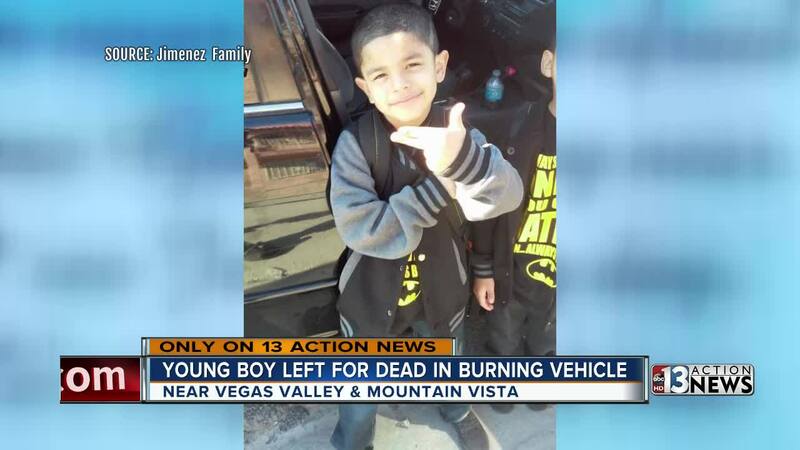 ORIGINAL: The 10-year-old boy who was in a fiery crash on Vegas Valley Drive and Mountain Vista Street on Sept.15 has died. The boy has been identified as Zion Jimenez of Las Vegas. He was pronounced dead on Sept. 21. Police are still looking for 23-year-old Jonathan Mora who was driving the vehicle the boy was riding in. Mora and Jimenez were reportedly related. Mora was driving approximately 100 mph when he hit a Toyota. The driver of the Toyota, identified as 62-year-old Roberto Santos, was seriously injured. Another passenger in the vehicle with Jimenez and Mora was also injured. He has been identified as 20-year-old Omar Moya-Luna. Anyone with information about where Mora can be found should call Las Vegas police.